Just for fun, we introduced (unleashed onto our unsuspecting readers would be a more apt description) our friend Achamba in an earlier blog post. Unexpectedly, despite his superiority complex, obnoxious personality and general sh*tty attitude, he got quite popular among our readers. So we asked him to hang around and share more gyan about himself and the world he operates in. He makes the occasional guest appearance on our blog to help tense and stressed out MBA applicants unwind. If you've missed meeting him, here's a quick introduction to all that he has been doing so far. Does he really earn so much? Super-powers in this day and age? Is he responsible for my lay-off? Why is he wearing a power-tie on a casual Friday? Our man generates a lot of interest, envy and questions everywhere he goes. Read all about how it started. Achamba's journey from being a who-cares-a-damn to...umm...who-cares-a-****. 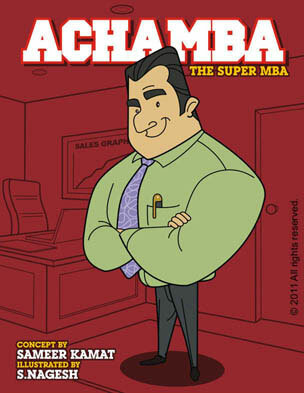 Read more about: Achamba - The Super MBA . Achamba's journey started with an MBA entrance exam. He got a high score and went on to attend a top school. He claims it was hard work and an unnaturally high IQ that made the difference. Others say it was pure luck. Who are these 'others', you may ask? They are the same guys who didn't crack the MBA entrance exam. So we asked Achamba to do a little detective work for us and the findings were intriguing. Read on and prepare to be shocked. Here's what can happen when people fail MBA entrance exams. You think it is just the MBA that's getting Achamba all the frequent promotions? You couldn't be more wrong! Achamba reveals the magical tool that has helped him sound knowledgeable in meetings with the senior management. No matter the topic, you can sound as impressive as Achamba and be in the running for a quick promotion. Read how to impress your boss. Achamba did some research work to find out why MBA applicants from India were aiming for MBA colleges abroad. Initially, most of them gave standard and predictable answers. ‘Broaden my horizons and deepen my pockets’ was the top response. But Achamba wasn’t one to give up so easily. He had watched enough episodes of Rendezvous with Simi Garewal to know how to break up hard exterior shells and get the water flowing. If you are intending to refer to MBA essays as examples, that’s one thing. Re-using them as templates is going too far. Here's what can happen when you stretch those tips too much. Read MBA essay samples that won't work.